Krish, Trish and Baltiboy –three lovable minstrels take you on a wonderful journey into the world of Indian folktales and folk music. After spending many warm afternoons eating jamuns with his friend, the monkey, Mr. Crocodile takes some home for his wife. 2)Ttwo village monkeys set out for the city in search of a better life. 3)The lazy barber’s brilliant wit is beautifully presented in Patachitra when the barber sets out to the forest to make a living. 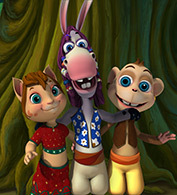 Munjal Shroff and Tilak Shetty founded an animation studio, Graphiti, in 1995. They have developed and produced shows such as J Bole Toh Jadoo with Nickelodeon and are currently developing an animated feature with Turner. Tilak Shetty became an Animation Director after co-authoring eight books on computer programming.